My partner and I started cruising on Norwegian about 5 years ago. Last summer we decided it was time to try another cruise line. Overall the cruise was okay, but it just wasn&apos;t Norwegian. They didn&apos;t seem as organized. We always felt like we were in a line or corralled somewhere waiting. The food was just okay. The shows were not creative. Nothing seemed to go smoothly. But with the Norwegian Spirit it was like coming back home. Everyone on the staff smiled, everything was well thought out and planned, the food was great...even the buffet was good, fresh and lots to choose from, and the shows were very entertaining. Night life had good options... there was live piano music, live rock music, dancing, etc. I ordered a Mai Tai and it was a real Mai Tai! We did something different every night. All of our excursions were very good and the tour guides were knowledgeable and took good care of us. Specific things to know about this cruise. Casablanca, Morocco was the most challenging of the ports. The city is very dirty and unkept. We did not feel unsafe, but didn&apos;t exactly feel comfortable to venture out on our own either. While walking through the streets you get asked on a regular basis to purchase things... if you ignore them they will go away. I definitely recommend doing an excursion through the ship. We did the Hassan II Mosque and it was very nice. All other ports were very nice! Very safe and comfortable. With lots of options for excursions. The ship is older, smaller, with smaller spaces and can use some updates. But, it was clean and well kept. Our balcony room was nice, but again smaller than we are used to. Balcony was tiny, but worked out. Bathroom was very dated, but was clean and functional. Again, It was a fantastic cruise and we would definitely recommend this itinerary. We will be back on Norwegian again this summer for a Mediterranean cruise! My partner and I started cruising on Norwegian about 5 years ago. Last summer we decided it was time to try another cruise line. Overall the cruise was okay, but it just wasn&apos;t Norwegian. They didn&apos;t seem as organized. We always felt like we were in a line or corralled somewhere waiting. The food was just okay. The shows were not creative. Nothing seemed to go smoothly. But with the Norwegian Spirit it was like coming back home. Everyone on the staff smiled, everything was well thought out and planned, the food was great...even the buffet was good, fresh and lots to choose from, and the shows were very entertaining. Night life had good options... there was live piano music, live rock music, dancing, etc. I ordered a Mai Tai and it was a real Mai Tai! We did something different every night. All of our excursions were very good and the tour guides were knowledgeable and took good care of us. Specific things to know about this cruise. Casablanca, Morocco was the most challenging of the ports. The city is very dirty and unkept. We did not feel unsafe, but didn&apos;t exactly feel comfortable to venture out on our own either. While walking through the streets you get asked on a regular basis to purchase things... if you ignore them they will go away. I definitely recommend doing an excursion through the ship. We did the Hassan II Mosque and it was very nice. All other ports were very nice! Very safe and comfortable. With lots of options for excursions. The ship is older, smaller, with smaller spaces and can use some updates. But, it was clean and well kept. Our balcony room was nice, but again smaller than we are used to. Balcony was tiny, but worked out. Bathroom was very dated, but was clean and functional. Again, It was a fantastic cruise and we would definitely recommend this itinerary. We will be back on Norwegian again this summer for a Mediterranean cruise! Cabin was nice, but dated. It was small, but the use of space was good. Charming La Vila Joiosa and Altea, nice day touring these charming little villages. Each with its own style and charm. We arrived a day early and stayed 3 days after the cruise. Fantastic city with a very good subway system. We also used the Hop Off Hop Off to get the lay of the land. 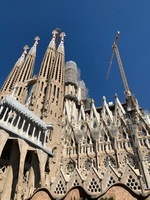 Went to the Picasso Museum, Sagrada Familia, walked around the Gothic Quarter. Had a great seafood Paella at La Fonda Del Port Olimpic. Excellent service and food!! This port is a little adventurous. City is dirty and unkept. The street vendors are a little pushy. But, the tours of the Hassan II Mosque, Chellah and the Mohammed V Mosoleum were very nice. We had to watch the tour guide because walked fast and didn&apos;t hold up his sign. I would definitely recommend the tour because of the unique cultural experience. This is a must see. Absolutely incredible! Very cool thing to see. This excursion also takes you to Porte de Mogan which was a nice place to walk around, shop and get a nice bite to eat and look out at the marina. Use this cable car to go up to where the Toboggan Rides are. It&apos;s quite a view. Nice drive through the mountains and an amazing view down to the valley at the Nuns Village. We did not actually take the Toboggans down the streets, since it wasn&apos;t a part of our tour, but were able to watch the guys take other people down and it&apos;s pretty facinating to watch. This was a very nice tour. Our guide was wonderful... fantastic sense of humor and very knowledgable. Both towns were very nice we had free time to walk through the local market, which was amazing... felt like we went back in time 50 or more years.